given a name value map, return a serialized query string. Definition at line 49 of file lluri.h. Definition at line 127 of file lluri.cpp. Definition at line 131 of file lluri.cpp. References mEscapedAuthority, mEscapedOpaque, mEscapedPath, mEscapedQuery, and mScheme. Definition at line 206 of file lluri.cpp. References escape(), isDefault(), mEscapedAuthority, mEscapedOpaque, and opaque(). Definition at line 243 of file lluri.cpp. Definition at line 325 of file lluri.cpp. Referenced by tut::ensure_equals(), LLHTTPClient::get(), and update_dialog_callback(). Definition at line 347 of file lluri.cpp. Definition at line 317 of file lluri.cpp. References buildHTTP(), llformat(), path(), and query(). Definition at line 309 of file lluri.cpp. References buildHTTP(), llformat(), and path(). Definition at line 296 of file lluri.cpp. References buildHTTP(), mapToQueryString(), mEscapedOpaque, mEscapedQuery, path(), and query(). Definition at line 248 of file lluri.cpp. 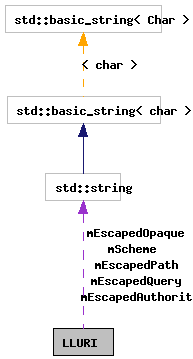 References escapeHostAndPort(), escapePathComponent(), lldebugs, llendl, LLURI(), llwarns, mEscapedAuthority, mEscapedOpaque, mEscapedPath, mScheme, and path(). Referenced by buildHTTP(), LLHTTPClient::get(), and update_dialog_callback(). Definition at line 416 of file lluri.cpp. References hostPort(), isDefault(), and mScheme. Definition at line 45 of file lluri.cpp. Definition at line 122 of file lluri.cpp. Referenced by escapeHostAndPort(), escapePathComponent(), escapeQueryValue(), escapeQueryVariable(), LLPanelDirFindAll::getSearchURLSuffix(), LLURI(), and LLVoiceClient::sessionCreateSendMessage(). Definition at line 108 of file lluri.h. Definition at line 112 of file lluri.h. Definition at line 385 of file lluri.cpp. References findAuthorityParts(), mEscapedAuthority, and unescape(). Definition at line 421 of file lluri.cpp. References findAuthorityParts(), mEscapedAuthority, and mScheme. Referenced by defaultPort(), and LLSRV::rewriteURI(). query_map a map of name value. every value must be representable as a string. Definition at line 494 of file lluri.cpp. References LLSD::beginMap(), end, LLSD::endMap(), escapeQueryValue(), escapeQueryVariable(), LLSD::isMap(), and queryMap(). Referenced by buildHTTP(), and LLServiceBuilder::buildServiceURI(). Definition at line 342 of file lluri.cpp. Definition at line 404 of file lluri.cpp. Definition at line 438 of file lluri.cpp. Definition at line 443 of file lluri.cpp. Definition at line 454 of file lluri.cpp. References LLSD::emptyArray(), lldebugs, llendl, and unescape(). Definition at line 448 of file lluri.cpp. Definition at line 337 of file lluri.cpp. Definition at line 69 of file lluri.cpp. References c, end, and hex_as_nybble(). Referenced by authority(), hostName(), opaque(), password(), path(), query(), queryMap(), and userName(). Definition at line 392 of file lluri.cpp. Definition at line 140 of file lluri.h. Referenced by authority(), buildHTTP(), hostName(), hostPort(), LLURI(), password(), and userName(). Definition at line 139 of file lluri.h. Referenced by asString(), buildHTTP(), LLURI(), and opaque(). Definition at line 141 of file lluri.h. Referenced by buildHTTP(), escapedPath(), LLURI(), and path(). Definition at line 142 of file lluri.h. Referenced by buildHTTP(), escapedQuery(), LLURI(), query(), and queryMap(). Definition at line 138 of file lluri.h. Referenced by asString(), buildHTTP(), defaultPort(), hostPort(), LLURI(), and scheme().